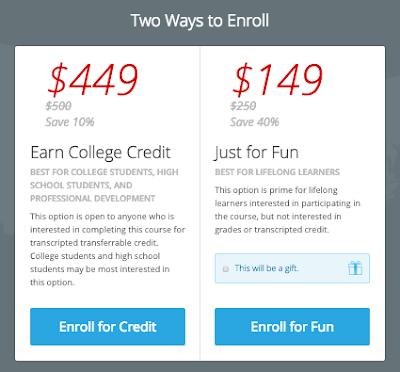 Online Courses and Marketing Fluff: What is an immersive history course? So, we have a new online course program at my school, "the very first television network-branded online course for credit" as Variety magazine online proclaims. The first course is "United States, 1865 to the Present," and there will be more history courses to come. You can find out more at HistoryChannel.ou.edu. Here's the badge you can get (for $250), and three units of University of Oklahoma college credit are also available (for $500). Update: Both options are now discounted. In the big marketing push for this new online course, the hyperbole is naturally extreme. For example, at the HistoryChannel.ou.edu page we are told that the course is like no other, the first of its kind, taking online learning to the next level. In the press release, we are told that the course is unique, groundbreaking, singular, world-class, pioneering, and innovative. Update: A recent marketing email I received describes the course as "unforgettable," so that's another word to add to the fluff list. Update: You can also hear Professor Gillon claim that the course is "immersive" in this marketing video. It's no doubt pointless to complain about all the marketing fluff words (unique, world-class, groundbreaking, etc. ); that's just how the marketing game is played these days. But a word like "immersive" makes a specific claim about the course design that is both misleading and inappropriate, and it is that wrong use of the word "immersive" that I want to focus on here. Although the course is closed, there is some sample content provided at the OU website, along with a syllabus. So, let's look at that sample content. Is this course immersive? No, it is not. This is simply a cookie-cutter video-driven course in which students watch videos, read the written materials that accompany the videos, and then participate in discussion boards, just like in online courses ten years ago. The syllabus confirms that the discussion boards are the core component of the class. Discussion board posts count for half of the grade, two short papers (3-5 pages) each count for one-sixth of the grade, and quizzes count for the remaining one-sixth. The discussion board posts will be graded with a rubric, as will the two short papers. Because there is a discussion board, the marketing people describe the class as dynamic, interactive, engaging, etc. Presumably the course earns the title "rigorous" because of the two short papers. As for the rest of the hyperbole — pioneering, groundbreaking, singular, unique, like no other, etc. — it's just the usual marketing fluff. I'm not really even sure how effective that kind of fluff is anymore, but it certainly seems to be inevitable. The real problem, though, is this use of the word "immersive." Just because something is online does not make it immersive, although that must be what the marketing people concluded, and no one saw fit to correct their error. What is really discouraging about turning "immersive" into just another marketing fluff word is that immersive learning in history is a very real and very exciting course design option. Consider, for example, Reacting to the Past, an immersive role-playing approach to teaching history that is now being used at over 300 colleges and universities. You can find out more at the Reacting to the Past website, and there is also a new book out by Mark Carnes — Minds on Fire: How Role-Immersion Games Transform College — which provides an overview of Reacting to the Past and its great educational potential. In 2013, I attended a Reacting to the Past regional workshop (for which I paid out of my own pocket — that's how excited I was to learn more about this approach to teaching history), and at that workshop I played the game about India: "Defining a Nation: India on the Eve of Independence, 1945." Players are assigned roles before the game begins, and then they prepare by reading detailed background material about the topic as a whole, along with specific materials for their assigned role. Some roles are historical figures (e.g., Gandhi, Jinnah, Ambedkar), while other roles are generic (I was a member of the Indian National Congress). You stay in character for the duration of the game; some people also stayed in character outside of the game too — I guess you could call that extreme immersion! I had an excellent experience with the game, and if I were teaching history classes, I would definitely be using this Reacting to the Past model. Unfortunately, despite the claim in the press release, there is nothing immersive about OU's first History-Channel-branded online course. It is just another video-driven, discussion-board-dominated online course like pretty much every other online course being offered by companies like Coursera and the many schools that have jumped on this video-driven online course bandwagon. Yes, I know the marketing people have to sell the course, so naturally they are going to use all the marketing fluff words that they can muster; that's inevitable. Still, I am sad to see that "immersive" is apparently now just another fluff word like "engaging" and "interactive." The kind of immersive history learning promoted by Reacting to the Past is one of the most exciting things I see on the educational landscape right now, something of substance in the midst of all the fluff. 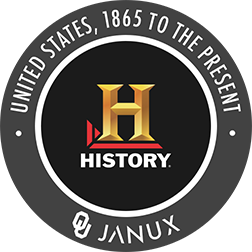 So, maybe ... just maybe ... the other courses that OU is planning to develop with the History Channel really will be immersive, going beyond the video-discussion model in order to take advantage of what Reacting to the Past and other innovative programs can offer. And what a great thing that would be! Update: For a comment from a member of the OU History department, see the write-up in Chronicle of Higher Ed. Update: There is now also an article in Inside Higher Ed. In that article, we learn that revenue for the course is being split 50-50 between OU and the History Channel. To my way of thinking, that seems really surprising: we certainly would not split revenues 50-50 with the company that provides the textbook for a class. But our relationship with History Channel is different from the relationship we might have with a textbook publisher: this is not just about content, but about branding — so presumably part of the reason why History Channel is able to make a claim for half of the revenue is that enrollment in the class will be driven by the marketing boost of the History Channel brand. Anyway, there is clearly much worth discussing; I added a couple of comments at the article's discussion space since we don't really have a discussion space of our own at OU. We offer online courses, yes, but not an online discussion space to talk about those courses! Happy weekend! I have some time for Connected Courses this weekend, and I really wanted to get back to this tension between content and process that emerged in some comments and discussion this past week. Over at his blog, Bill Benzon published a post this week that was really thought-provoking for me: Learning/Teaching Styles: Connected Courses Exemplars. He also posted a chunk of that over at the "meta-forum" that Gardner Campbell started for Connected Courses: Let’s talk about our course so far. What’s working? What’s not? And those conversations prompted two great blog posts from Simon Ensor: Summer holiday and Are we not content? From Simon's Are we not content? (read that title out loud: brilliant! ), we get something that I think we should call Simon's Four Principles. And they are great! All three of these examples show how content can be a means, a medium, for togetherness. Now, why should that be so hard? Aren't we all "together" in school...? Not really. The sad, strange thing about educational institutions is how little togetherness there really is, how little connecting there is in the form of sustained, back-and-forth dialogue. It is also very sad to see how "performance" has been corrupted to mean, not creating and making things, but instead "taking" things - taking a quiz, taking a test, taking an exam... and being graded. In his comments on Simon's post, Gardner also points out that, in addition to togetherness, there is a dimension of study and practice, and he raises that same issue in response to Simon's Summer Holiday post: "There's more than a shared journey-that-is-the-destination. [...] I just have a hard time with the idea that togetherness itself is all there really is. My old notions that new learning can change the world for the better die hard. The hashtag (our magic bus?) is not the learning." So what seems to be emerging here is a kind of Scylla and Charybdis of dangers: there is the danger of "all-content-no-togetherness" (as in far too many college courses, especially lecture courses and their digital doppelgangers, the xMOOCs) and there is also the danger of "all-togetherness-no-content" (a social media free-for-all of likes and plusses, but no substance). Those two things – learning about existing stories vs. crafting your own – are very different. It’s not at all obvious to me that the pedagogical techniques that work well in crafting stories will also work well in learning to analyze existing stories. They may, they may not. But I wouldn’t want to assume so. Nor for that matter, do I think there is a sharp and clear difference between the two activities. There isn’t. But there is a difference in emphasis and in the end product. Bill then makes a comparison to science and engineering. Again, it's not meant to be something rigid, but he highlights the difference between science and engineering this way: "It’s one thing to use your knowledge of thermodynamics to design and build a more effective automobile engine. It’s something entirely different to run an engine in the lab so you can study thermodynamics." So, if we now map Bill's examples onto some of the categories that emerged in Simon and Gardner's observations, we end up again with that Scylla and Charybdis of extreme dangers: at one end, the danger of "all-content-no-togetherness" where we know so much and do so little, science without engineering ... and, at the other end, "all-togetherness-no-content," a kind of mad attempt to do things without knowing what you are doing, engineers with no science. Sadly, my own education is a perfect example of that first danger: all-content-no-togetherness and all-knowing-no-doing. I took one content-heavy class after another as an undergraduate and then as a graduate student: read read read, take test ... read read read, write paper... read read read, take exam. So I emerged from that education with a love of books, and not much else. I was a very skilled reader, a "well read" person as the saying goes. But what could I do really, besides read...? Not much. I was not even a very good writer. Oh sure, I could crank out a literary analysis (any approach, any style, you name it) in my sleep... and I did. Nobody would ever want to read such papers, though — I didn't even want to read them; I threw them all away. And creative writing? Nope. I had read mountains of novels, short stories, poetry... but I could not write a novel or a short story or a poem. Worse: I would not have dared to. As a result, I felt like a highly literate fraud. I could analyze stories, but I could not tell them. I knew lots of story science, but no story engineering. Yet it was true that I really did love books, I loved reading, I loved learning. So much so that I ended up with a Ph.D. in Comparative Literature and a university teaching job. I figured that my love of reading was a good thing in and of itself, and I could just ride that wave for the rest of my life. Right? Wrong. Because when I taught my first class, I found out ... there were students who hated to read. There were students who thought the reading was ... boring. Stories BASED on traditional myths and folktales. So, we were still reading a lot, but now we were reading because we were going to write. No more writer's block: because you have the raw stuff right there. No more boredom, because you are going to tell the story in a way that is not boring! And now you have a reason to read: you are looking for the stories you want to use for your own purposes. And, luckily for me, this succeeded beyond my wildest dreams. The students wrote such great stories! I loved reading their stories! They loved reading each other's stories! You can read their stories here: eStorybook Central. They had new insights into the stories now that they were storytellers themselves, able to appreciate the challenge of getting a story started, bringing characters to life, writing dialogue, and all the choices that every storyteller must make. People talk a lot about flipped classroom... and I guess you could say this was my flip: instead of the content being the end goal, the content now became a means to an end... and that end was to tell stories. I've made lots of changes to my classes in the past twelve years, but none of those changes can compare to that one big decision: turning my classes into an adventure in storytelling, where we read in order to write, and we write in order to share our stories with each other. That was the big thing; everything else since then has been tinkering. This is not to say that I don't care about content. I care about it a lot. But the way I choose the content now is to support the writing-and-sharing process that is the real heart of the class. So, for example, in my Myth-Folklore class, I spent last summer compiling what I call an UnTextbook that contains a hundred different reading units for the students to choose from: I want them to make choices as writers, and I also want them to realize that they are making choices as readers also. I want them to see a world of stories, full of theme and variation, where the storytellers are constantly riffing off one another in the same way that the students likewise will be riffing off those same stories in brand-new ways. I want them to see that different people like different things; there is no one story that is going to please everybody, and there is no one story that we all must read. We will all write our own stories. And that is... life. The UnTextbook (new this semester) is helping make the Myth-Folklore class even more successful than it was before, and my project for this coming summer is to find something like the UnTextbook to do in my other class on Indian Epics. The content question is more complicated there (epics! eeek! they are so darn big), but I have learned so much from creating the UnTextbook that I am now full of ideas for how I want to revisit the content in there and mix it up to give students more choice and more variety. So, I guess my conclusion in response to the great questions people raised about content and process is that by thinking about process, I ended up doing a better job with content too. Instead of content and process being somehow separated, they are now integrated, where the content feeds into the writing-and-sharing process, and that writing-and-sharing process then reinvigorates the content, in a pretty happy back-and-forth for both the students and for me. Connection is nothing without content. Dialogue is nothing without learning. Which is to say: for all that I have completely reimagined the reading content of my classes over the past decade, I have never once thought about NOT reading. No connection without content. But I would also never think about doing a class now without storytelling or without blogs. No content without connection. Be CONtent ... and be conTENT. Happy is he who is content with his lot. 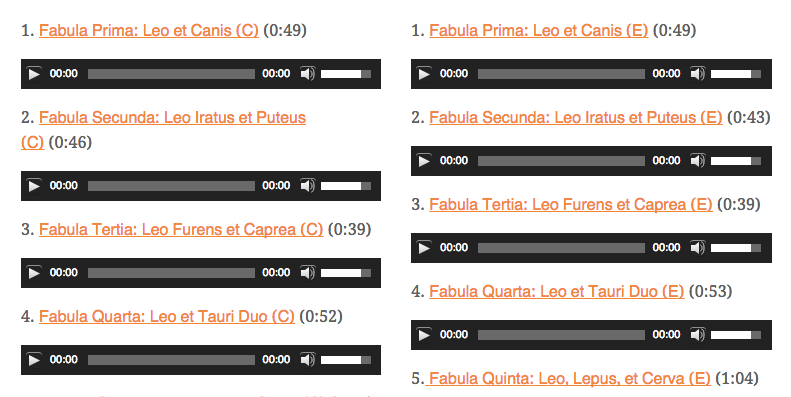 I got an email from a Latin teacher, Justin Slocum Bailey, who has added a section to his beautiful website, Indwelling Language, which contains his audio recordings of Aesop's fables taken from a book I published online a few years ago, Mille Fabulae et Una: 1001 Aesop's Fables in Latin. Justin is such a great performer and he offers the fables in both classical pronunciation AND ecclesiastical pronunciation! How cool is that? I would say that is very cool indeed! He doesn't just tell people that yes, there are in fact many ways to pronounce Latin (sadly, a subject much disputed amongst Latin teachers)... he shows them! Even if you don't know Latin, you can appreciate what a great reader Justin is by taking a listen: Indwelling Language Audio. That blog is something I have had online for many years... my school may refuse to let me teach Latin online (that's another story), but they cannot stop me from sharing my love of Latin with the world via the Web. When I started the blog back in 2005, it had no readers at all, like any new blog, and I remember getting so excited when I reached 100 readers! Now there are over 2000 people subscribed to the email option alone, and I get a couple of hundred visitors per day to each post. In a Latin class at my school, I could have reached maybe 20-30 people each day... but I do better than that every single day with my blog. It's through the blog that I got to connect with Justin and so many other wonderful Latin teachers and students, along with the hundreds of people I will never know directly... but with whom I am connected nevertheless through our love of Latin fables and proverbs, a love that intersects at the blog. As for the book, oh, the book is a weird one, one that no traditional publisher would ever touch, but I am so proud of it: it is the single biggest collection of Aesop's fables in Latin (well, probably in any language!) — 1001 Latin fables, without duplicates, drawn from an enormous array of Latin sources (classical, medieval, and Renaissance along with even more modern sources like my beloved François-Joseph Desbillons), sources that I was able to discover thanks to Google Books and other digital libraries online. What's more, I did something no academic publisher would ever have allowed: I re-crafted the fables to make them useful to Latin students, turning the poetry into prose and shortening the fables so that none of them is longer than 120 words (see p. 426 of the book for a detailed discussion of my editorial process). You can find out more about the book here at this massive blog which contains all 1001 fables as linkable blog posts (very useful for Justin's purposes): Mille Fabulae et Una: 1001 Aesop's Fables in Latin. There's also a free PDF download of the book itself. So, I published this book in 2010. My hope was that it would, at last, convince my school to let me develop an online Latin course... but that hope failed. After ten years of asking permission to create an online Latin course, I have stopped asking and yes, I've given up all hope of ever teaching Latin at my school again. But that doesn't mean I have given up hoping for other good things; in fact, one of my personal mottoes is: Spes ultima dea (Hope is the last goddess). And as soon as Justin let me know about the audio yesterday, I immediately thought of the Biblical proverb that Howard Rheingold had quoted in one of the Connected Courses webinars early on: "Cast your bread upon the waters: for you shall find it after many days." (Mitte panem tuum super transeuntes aquas, quia post tempora multa invenies illum.) 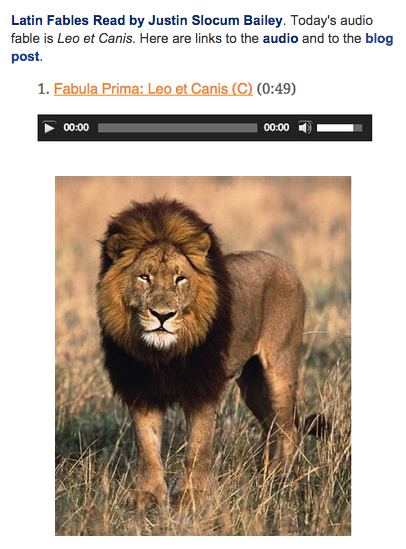 So, indeed, after four years, here I find the fables again... this time in lovely audio form! 1. The Lion and the Dog. A dog runs into a lion and teases him, "Wretched creature, worn out with lack of food, why do you run through the woods and lonely places? Look at me, fat and shiny. What's more, I obtain these things not by work, but at my leisure." The lion replies, "You do indeed have your feasts, but you also stupidly wear a chain. Go ahead and be a slave, you who are able to do that; as for me, I am free, and I will not be a slave." I think the moral of that fable speaks for itself. And, even better, it resonates with Simon's lion post from a week or so ago. Looking for more lions? Go visit Simon here: Zootopia. Nugget: How Fast Do You Type? Eeeeek, "Nuggets to be posted to blogs by Oct. 17." So, I'm late... sue me! Ha ha. But seriously, there's no way I can get things done for Connected Courses except on the weekends and even then it's a struggle (but I'm not complaining - it's only because things are going so fabulously well in my classes and I'm having way too much fun with all of that). The Web, on the other hand, breaks the traditional publishing model. The old model is about control: a team works on a document, is responsible for its content and format, and releases it to the public when it's been certified as done. Once it's published, no one can change it except the original publisher. The Web ditches that model, with all its advantages as well as its drawbacks, and says instead, "You have something to say? Say it. You want to respond to something that's been said? Say it and link to it. You think something is interesting? Link to it from your home page. And you never have to ask anyone's permission." Then it adds: "And how long will it take to do this? I dunno. How fast do you type?" I LOVE THIS. Let me take it one small piece at a time. Loosely joined. The Web, on the other hand, breaks the traditional publishing model. The old model is about control: a team works on a document, is responsible for its content and format, and releases it to the public when it's been certified as done. Once it's published, no one can change it except the original publisher. I have published several books with traditional publishers and, I am pleased to say, NEVER AGAIN. For me, as a writer, self-publishing is the only way to go. I've now self-published four books, and I do that in a process that is Internet-based, with a blog to book to blog cycle. More about that here: Blogging: Websites, Blogs, and Books. Want my books? Take them: the PDFs of all four books are sitting on the Internet waiting for you to take/make your own copy: Special Edition: #PDFTribute to Aaron Swartz. The Web ditches that model, with all its advantages as well as its drawbacks, and says instead, "You have something to say? Say it. And we ALL have something to say. It's called... democracy. An untouched drum does not speak. You want to respond to something that's been said? Say it and link to it. It is ALL a conversation. It can happen face to face in real time, or it can happen over hyperlinks, transcending time and place. Connect however you want, whoever you are! You think something is interesting? Link to it from your home page. The world is SOOOOOOOOOO interesting. I remember being bored as a child, which seems incredible to me now. I have never ... never ... been bored as an adult. For example, the Internet is now the biggest library in existence. Link to Internet Archive. Link to Project Gutenberg. Link to Hathi Trust. Link to LibriVox. Link to Sacred Texts Archive. More books than could ever fit in my house. More books than I could ever read. Knowledge is the sunlight of the mind. And you never have to ask anyone's permission." I know not by what power I am made bold. Then it adds: "And how long will it take to do this? I dunno. How fast do you type?" I don't know about you, but I type really REALLY fast. I hope my students can learn to type fast too. It's an advantage. So, seize that advantage! 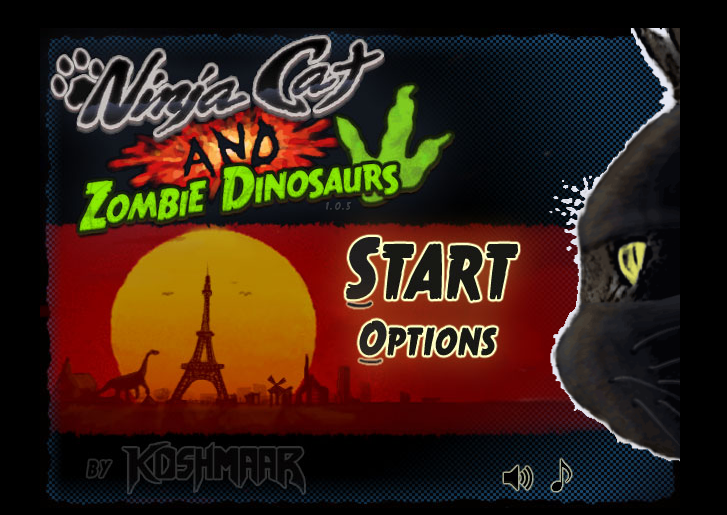 Typing Game: Ninja Cat. So what I did was to quickly Diigo the Twitter feeds I am subscribed to in Inoreader right now (limit is 60, so I stayed just a little bit short of that). So now when I go to someone's Twitter page, I can instantly see if I am subscribed to them in Inoreader or not. Quite a few of these people are folks I have met in Connected Courses over the past several weeks! This will also come in handy when I need to curate more carefully, removing some people from my Inoreader Twitter subscription (right now, I have some people in there with whom I actually do interact pretty regularly at Google+ also, so I don't really need their Twitter in the same way I do for people who are not G+ users) ... with Diigo, I can just change the Twitter Inoreader tags to be something like Twitter InoreaderRetired. That way, I'll have a record of Twitter feeds that I did enjoy having in Inoreader, and if Inoreader lifts the cap or I decide to revisit those feeds, Diigo will have a list for me. I really do appreciate the power of Diigo... but I do not use it as much as I should. I wish I could figure out what the strange emotional disconnect is that I have with Diigo. I loved Delicious. It just made me HAPPY to do anything with Delicious. My happy factor with Diigo is about zero. As a result, it really took some urging from my Google+ buddies even to get used to using Diigo. I do use it, but it is not FUN. What's up with that, I wonder? Inoreader, on the other hand, is fun AND powerful. I would rate Twitter as lots of fun, but low on power. I would rate Diigo as high on power, but low on fun. Anyway, I am glad I figured out this solution. As part of my Connected Courses project for the next weeks, I will review that Twitter selection at Inoreader and see if I am making good use of it. Oh, I did something fun with the Twitter folder over at Inoreader: I wrote a rule to exclude replies, so that it emulates the Twitter experience better. If a tweet does not start with @ it gets a tag called "Twitter Original," which is probably most of what I will be reading when I scan the Twitter stuff at Inoreader. I also played around with writing regular expressions for rules in Inoreader. Connecting with Inoreader: Blogger integration! Whoa... this is pretty fascinating: there's a Blogger integration feature at Inoreader, and when I click it, it pulls the complete HTML of the item (in this case, a lovely Twitter post from Jackie Gerstein) into the post. So... that means I can send things over to my Digital Tools blog this way. It doesn't look like I can add labels (? ), but it has the full editor here. So, how did THAT week disappear??? Man... I blinked, and it was gone. I have not done any Connected Courses since last Monday where I really - REALLY - enjoyed the webinar with Gardner Campbell et al. The semester will continue at its all-consuming pace for the remaining weeks of Connected Courses, in which I really do want to participate, so that means I need A PLAN. And I think my plan is going to be a new experiment in connectedness, rebuilding my PLN in Inoreader, seeing if I can streamline and optimize the time/spaces when/where I interact with people. I am feeling scattered, and not in a good way, right now. On the one hand, I know that every bit of connectedness helps make not just my job, but my life, more enjoyable and valuable... but it can also become overwhelming and confusing. So, I know that Google+ will continue to be at the center of my online life... but there are a lot of people who are not on Google+ and never will be, and some of my Google+ buddies also have strong online presences elsewhere. Right now, I've got Google+ going but also Feedly and Twitter and Inoreader... and I don't feel like I am doing a good job of keeping up. So, with the new Twitter integration announced at Inoreader this week, I am going to make it my Connected Courses Project to get myself "connected" at Inoreader, and see if I can start 2015 with a less hectic sense of connectedness. Well, even as I type that, I know that life online is going to be hectic. But I know I will learn a lot by TRYING to do this anyway, ha ha. It's like housecleaning: yeah, your house is going to get messy again. But that doesn't mean you should give up on housecleaning. Just the opposite: it makes it all the more imperative (I speak from personal experience there...). 1. Chrome Extension. I installed the Inoreader Chrome extension. DOH. I cannot believe I had neglected to do that. This makes it super-easy to subscribe to content while browsing. I wish the extension let me put stuff in folders as I add it, but that's not a really big deal - the dashboard in Inoreader is really good at reminding me to sort and arrange things there. 2. Rules Clean-Up. I rewrote my rules so that they are better labeled and organized, and so that they are folder-driven. Before, I was using Inoreader for my classes only, so I could run the rules on "all incoming." Now, I run the rules on my class folders, and that way as I add new feeds, I'll be able to write other folder-driven rules for different kinds of content. That leads to a couple of duplicated rules as a result (some rules I run on both classes), but no big deal. Rules are, for me, a key feature of Inoreader. With my current subscription level ($30/year), I can have 20 rules... although I really am on the verge of upgrading to the top level ($50/year) so that I can have unlimited rules. ... Upgrade ... Well, as I typed that, I talked myself into upgrading. Because really, $20/year more is nothing... and the rules are amazing. It would be silly for me not to experiment with lots of different rules in order to save $20. So... pause while I go upgrade.... upgraded. 3. Import Student Comment Feeds. So, the first new kind of content I added was my students' Blogger comments. This was easy to do. I just export the OPML file from Inoreader of my students' blogs (two folders, one for each class I teach), and changed "posts" to "comments" in the OPML file (based on the Blogger convention; they all ended up choosing Blogger), and then imported the new OPML files. Easy-peasy. I don't really need any rules for the comments (although I like the idea that I could play around with that in future...!). Since I now have those in Inoreader instead of Feedly (where they were before), I can now share them with you and you can see what a super job my students do with comments! Right now they look a little funky because the import brings them in by blog, not by date, but as new comments come in this weekend, you'll see more current comments at top of the clippings. * Read together with blogs. Of course, I need to do a good job of getting my blogs moved over also; I've been using Feedly but will be so glad to move on. Feedly wasn't bad but it just wasn't good either. * Use rules and search. I really have not explored Inoreader searches because I haven't needed that with my students; now that I will be using it as my primary reader, search will be GREAT. * Use tags. Lack of a feature like that is probably my biggest problem with Twitter. Plus I can create all kinds of tags based on all kinds of purposes. * View options. In particular, I will be able to see full-size of images instead of just card view. I like images, and the viewing experience in Inoreader works well for me. Twitter doesn't offer different options like that. * Curate effectively. I think I can have 60 Twitter feeds with my top-line subscription; that definitely should be enough to keep up with the people I truly need to keep up with. * Quickly share with Google+. I tested that this morning and I really like it. Being able to single click to Google+ with my comments is also really good; I often just cannot compress what I have to say into 140 characters. Okay, I'll stop there. This will be my first post in new Connecting-with-Inoreader project. More to come. Right now, I am seriously excited. 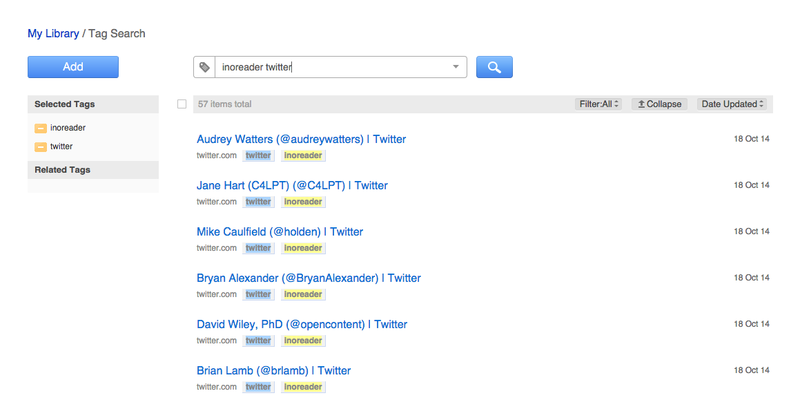 The Twitter integration was perfect timing for me so, thanks again to the Inoreader guys! As I work through this step by step, I think I am going to feel much more happily connected than I did before. No, Inoreader cannot give me MORE time to spend connecting with people online... but I am optimistic that it can help me to spend that time better! Fingers crossed. I'll report back later as I work on my Twitter integration experiment! 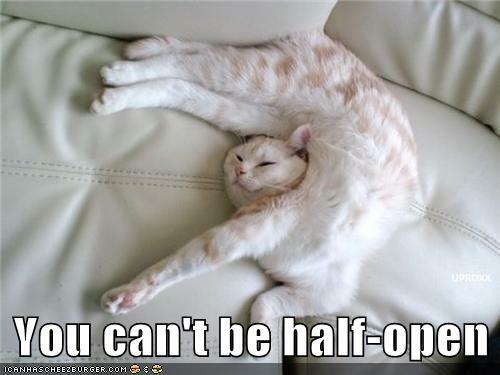 You cannot be half open. Yes, it's me again... and it's Mariana Funes again... and I am clearly having too much fun! Source: The psychology of open: On wrestling your inner MOOC. 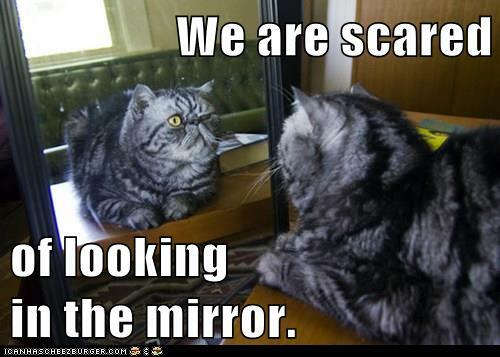 We are scared of looking in the mirror. And more from the wonderful post by Mariana Funes, The psychology of open: On wrestling your inner MOOC. And here's yet another quote for Connected Courses "Daily Connect" that comes from a section heading in Mariana Funes's fabulous post (can you tell that I loved this post? I LOVE THIS POST): The psychology of open: On wrestling your inner MOOC. 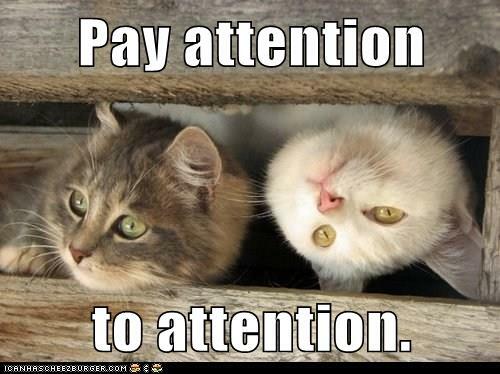 Pay Attention to Attention. This brings us back to the need for training attention. Our attention can be focussed on different realms of experience: the online external world, our sensed behaviours and feelings, our thinking patterns, or the meta-cognitive realm where we can attend to the whole not the parts. There are different types of attention as well as different realms to attend to and buddhist psychology has the most to offer us here as we talk about tackling our inner monsters. I highly recommend the study of the Attention Revolution by Alan Wallace. It humbled me into seeing that just to gain the ability to open the doors to trustworthy self-assessment requires years of practice. Treat each thing as if it were alive. We each are much more than 140 characters and, as James Hillman said, it pays to treat each thing ‘as if it were alive’. I might paraphrase this as ‘treat each comment or tweet you read as coming from a ‘thing’ that is alive and wants to be seen for more than the transactional usefulness they may have in the context of your PLN (personal or professional learning network)’ – but not as catchy, I know. 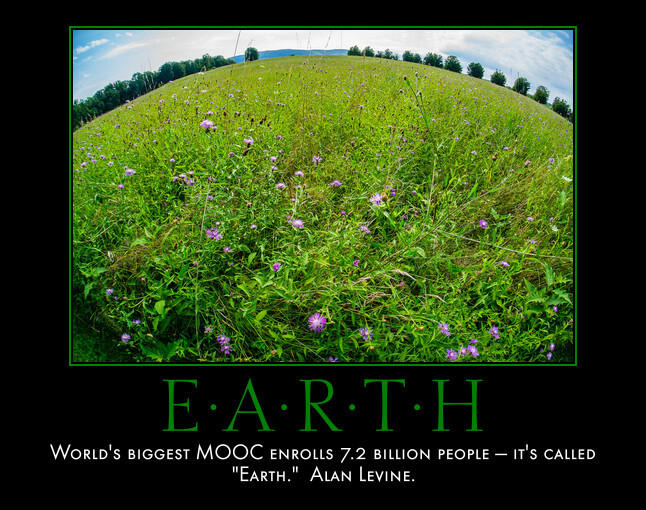 Ohhhhh, of course I absolutely love the Connected Courses Daily Connect about finding quotes and making quote memes. YES! 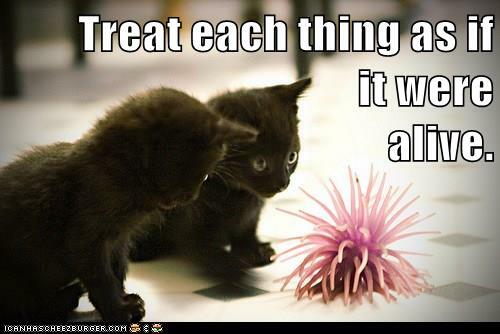 I have a blog called the Proverb Laboratory where I have collected lots of motivational posters (which I make with Automotivator) and LatinLOLCats (which I make with Cheezburger). I'll start with this item from Cory Doctorow's Little Brother that I found in Maha Bali's beautiful post: Untitled and messy: trust in the blogosphere. Curiosity or Security: What do YOU care about...? …so many people live within unhappy circumstances and yet will not take the initiative to change their situation because they are conditioned to a life of security, conformity, and conservatism, all of which may appear to give one peace of mind, but in reality nothing is more damaging to the adventurous spirit within a man than a secure future. The very basic core of a man’s living spirit is his passion for adventure. The reason that quote really grabbed me was because it both fits me — I'm definitely a non-conformist, a mostly carefree person without worries, and not a conservative in any sense — but at the same time, I would not describe myself as adventurous. Certainly not adventurous to the degree that Chris McCandless was, and really not even adventurous by more modest standards. So how is it that I manage to feel secure (without worries, not anxious, carefree)... even though I would not describe myself as adventurous? And that is what made me realize that I need to write up something about the etymologies of the words in English that come from Latin CURA because the paradoxical array of meanings in English go back to that Latin word. So, the Latin word CURA is a noun, and its basic meaning is "care, thought, concern," and much like those English words, Latin CURA can cover a wide range of experiences, from negative (trouble, worry, anxiety) to positive (care, attention, diligence). It was a very common word in Latin, and you can get a sense of the range of meaning in this detailed Latin-English dictionary online: cura. CURE: from Latin cura, in the sense of "to care" for something. We are used to the medical sense of the word now, but it originally had a spiritual sense, as you can see in the noun "curate," someone whose duty is the cure of souls. The noun "curator" has a more secular sense; to "curate" something is to care for it, to act as a keeper or guardian. CURIOUS: from Latin curiosus, meaning "full of care, full of concern" which now has a positive meaning in the sense of "eager to know, inquisitive" but it originally had the negative sense of "cautious, anxious, fastidious." From this adjective, we get the noun "curiosity." In the early 18th-century "curious" also came to mean a thing that "excites curiosity," which is why a person can be curious (eager to know), but things can also be curious (strange, odd, etc.). The English word "curio," a rare or unusual object, is a 19th-century abbreviation of "curiosity," in the sense of an object that excites curiosity. So, back to Maha's post and the question of security and adventure. While I would not call myself an adventurer, I am absolutely a curious person. In fact, curiosity might even be my dominant character trait, stronger than just about anything else. I am curious about pretty much EVERYTHING. And, just as the proverb warns us, "curiosity killed the cat," I could conceivably get into trouble because of my curiosity... not because I am a thrill-seeker, not because I am even a risk-taker... but because my curiosity is really unlimited! But here's something about that proverb: in its older form it was "care killed the cat," in the sense of worry, anxiety, etc. See, for example, Shakespeare in Much Ado about Nothing: "What, courage man! what though care killed a cat, thou hast mettle enough in thee to kill care." So, in the original sense, the proverb was about a scaredy-cat, a worried cat, an anxious cat. A cat who is insecure, not a cat who is curious. I am NOT a cat who is full of care in the sense of worry or anxiety. Instead, I am a curious cat. Cats do come in both varieties, as everyone has seen: scaredy-cats and curious ones. 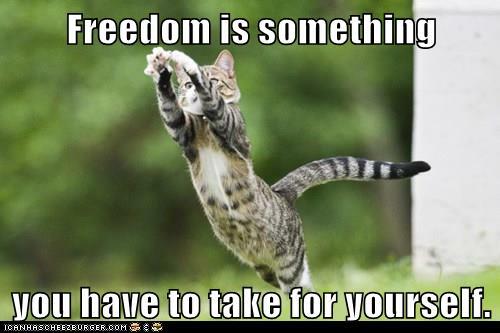 That contrast came up in an earlier post where I shared two of my Latin LOLCats, one for fear and one for fearlessness. In the end, then, my etymological diagnosis is this: security is not something of paramount importance to me, but curiosity is a driving force in my life. Given a choice between being full of cura (curious) and without cura (secure), I will choose curiosity over security every time. I'm not sure this really gives me any insight into why my colleagues can remain so un-curious about connected learning, but at least it helps me sort out just what kind of cura I really care about in my own life! Curiosity is the first step to hell. Well, today ran away from me (in a good way: it felt like FALL here... beautiful! ), so I did not get as much done for Connected Courses as I had hoped, but I am glad to have my Connected Courses Pinterest Board up and running as a way to quickly pin things to come back to later. Next week is one of my revision weeks also, so I should have more time than I did last week; my classes alternate between weeks of original writing and revision weeks... next week is revision! And I can attest to the power of connecting via Pinterest, because via her Connected Courses Pinterest Board, I connected with Tania Sheko in Melbourne... a woman of 30,000 pins. Whoo-hoo! Yet another a new connection to add to the many wonderful connections I've made over the past few weeks of Connected Courses. Pinterest is a tool that I have really enjoyed learning to use in the past year, largely because I am very visually oriented. Working with images is one of the things I most enjoy about working online! 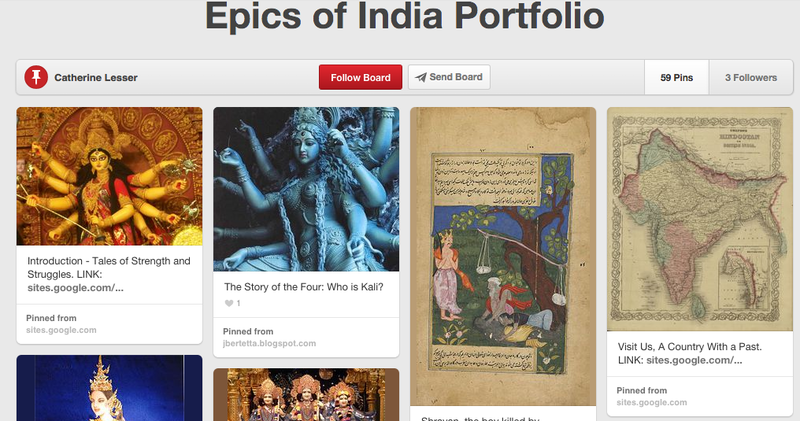 Last week Debbie Morrison wrote up a post about social tools for online courses, and she included the Indian Epics Pinterest Board of one of my students as an example. I was so excited about that! Follow Laura Gibbs's board Connected Courses on Pinterest. Becky's posted her news round-up which is my reminder to do the same! Here are some items that really got me thinking in the past week or so (and here are the previous round-ups). This series of posts on different dystopian futures for higher education is really excellent. OU seems to me stuck in the "Silos stand tall" scenario, which is his first of four scenarios. See also his Slideshare of the four dystopias. Fantastic collection of links to the outburst of LMS blog posts over the past couple of weeks. This is one of those LMS blog posts, pointing out that so-called collaboration tools in Blackboard et al. are not really collaboration tools at all. This is one of my favorite of the recent LMS posts. Jonathan's advice (and I agree) is "Be your own LMS!" Great blog post that contrasts the attitudes between students and faculty with regard to shifting student and teacher responsibilities. I was so excited that Debbie featured my students in this article as examples for Pinterest and Twitter, along with other social tools. Nice write-up about Kim Jaxon and Connected Courses. I sure wish I could lure some OU folks to participate in Connected Courses! More about Jaxon's work here: The Case for Open Courses in Higher Ed: Q&A with Connected Learning Educator Kim Jaxon. Fantastic portrait of Mia Zamora and how she participates in a web of connected learning. The psychology of open: On wrestling your inner MOOC and Of monsters, contemplation and information by Mariana Funes. Fantastic blog posts about the dynamics of people's fear of connected learning experiences on the open web. 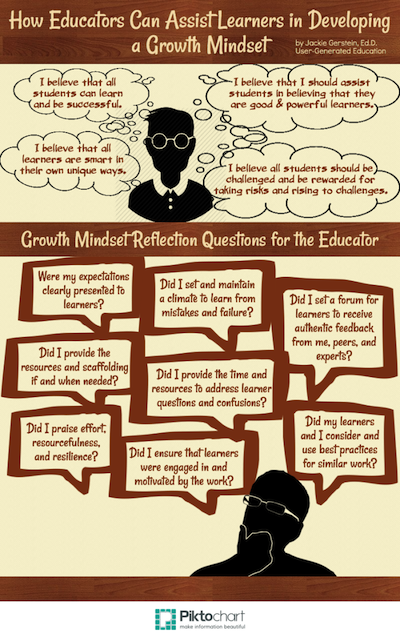 Another wonderful blog post from Jackie Gerstein about facilitating and coaching a growth mindset with students. And this LMS Sales Call video totally cracked me up!